Bathroom Tiles a quick guide to selecting the right ones. Bathroom Tiles A quick guide to selecting the right tile. Blog - Bathroom Tiles A quick guide to selecting the right tile. Selecting tiles for your new bathroom can be overwhelming. You can get a hardwood look with these porcelain tiles. They will provide the warm environment that wood does, with the water resistance of a tile. They come in many shades and sizes. 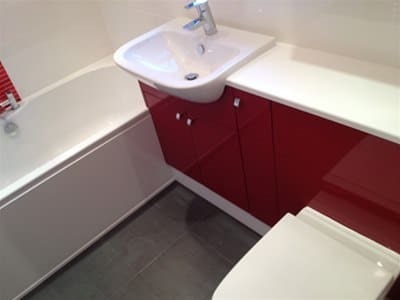 A White tile will provide a neutral base for more colourful choices in the rest of the bathroom. It will contribute to a refreshing atmosphere. Grey or white grout works well with white tiles. Geometric patterned tiles will exude sophistication and beauty. They are best with pieces like claw foot tubs and traditional style cabinets. 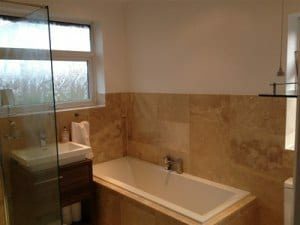 Natural stone tiles are a popular choice for bathrooms. You can mix and match within a color family for tiles in your shower and flooring. Some options are: marble, travertine, granite, sandstone, slate and onyx. These are available in many colors and shades. Natural stones are durable and unique in every bathroom installation.